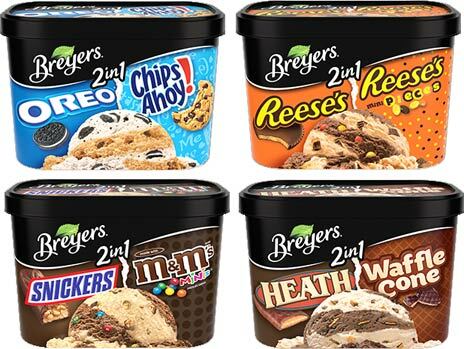 On Second Scoop: Ice Cream Reviews: Breyers 2in1 coming soon -- BLASTS no more! Breyers 2in1 coming soon -- BLASTS no more! [Post Updated] Wow, I've been doing this freezer aisle analysis way too long because I've been thinking for awhile now about how it was time that Breyers BLASTS! disappears and something new and "crazy" comes along. Well, time for Breyers to mix things up a bit. I'm not 100% sure what current competing product inspired this, but I do find it amusing. Turkey Hill did the same thing a long time ago with their Dynamic Duos lineup (2009 reviews here & here). Notice none of the description mention "ice cream" so they must still be frozen dairy dessert. I say still because these are basically just shoving two BLASTS flavors together in to one container. The only thing really new here is the mini Reese's Pieces though we haven't seen Chips Ahoy in a blast in a long time. So, do you like this idea? While the BLASTS idea has always been a good idea (just remember Edy's LOADED), the base ice cream always held it back. I think this concept might (should) be fun at least to some degree, but it's weird to look back at 20 Blasts reviews and not be strangely sad to see them go. I am hoping that the swirling of the two flavors adds a bit of magic here, but I won't hold my breath. Update Note: Despite Breyers website saying the two flavors are "swirled" together, people who are finding these are showing that it's one flavor on one side and the other flavor on the other side. Dear Breyers, this is why so many of us hate you. Update Note #2: Many Blasts flavors live on but in new non-blast packaging. They LOOK tasty, but like you said, I'm afraid the frozen dairy dessert will pull them down. The heath and waffle cone one sounds especially fun. I am a little sad to see the blasts go. The oreo flavor was the very first ice cream I ever purchased on my own, so...nostalgia? I do not like this idea at all because when you mix two different ice creams together, you normally end up with a less than ideal flavor. For instance, Ben and Jerry's Half Baked ice cream base has a mild chocolate ice cream flavor because the vanilla takes away from the chocolate and lowers the richness down a notch and the vanilla flavor is barely present due to the chocolate and vanilla being mixed together. Breyers would have been smarter to separate the ice creams. I would love to get two different flavors while paying the price for one. Fun? Most definitely! Good idea? Not as definite...for two main reasons. I don't love swirled flavors because they tend to cancel each other out and end up with a weird/weaker conglomeration of flavor. Also, two bad products (even if fun) put together makes one bad product! So, if it's fdd, then I think it will be a conceptually "more fun" but still bad product! (And, to combine these points, the soft nature of fdd will make it even more likely that the two flavors will run together). It's too bad that the blasts weren't so good...that chocolate with m and Ms was a disappointment (definitely not a blizzard in the grocery store aisle as I had hoped). I don't eat "Frozen Dairy Dessert". They can call it any playful name agreed on, if Ice Cream is missing from that name....I'm out! Breyers has been sheet for a long time. I'm personally down on the frozen dairy dessert. I want ice cream. Heck, now I can buy Wal-mart's brand of ice cream for 1.87 a container in an ever burgeoning variety of flavors. And they are pretty good actually! I had a cherry amaretto, that nut (pistachio), and coconut with fudge dipped almonds that were all really good for that price point. I wonder who is making them for wal mart??? I'd give them a chance. I rarely bought Blasts, so it works out. Rusty One - Breyers 2 in 1 Heath/ Waffle Cone: Vanilla and Chocolate with Heath Toffee Pieces and Fudge Covered Waffle Cone Pieces Frozen Dairy Dessert. Yes, confirming the label, this definitely tastes like frozen dairy dessert and NOT ice cream. Vanilla? Hard to detect actual vanilla and even harder to detect the chocolate. I found it hard to differentiate between the vanilla and chocolate. This tastes like it has dried milk solids. Re the Heath and Waffle Cone adders, there were some but not a lot and not enough to make up for a lacking quality substrate. As for real substance, this concoction weighs in at 3.707 lbs/ gal. For comparison, Wells Country Rich chocolate ice cream weighs in at 4.487 lb/ gal, or 21% more for the same volume. Would I buy Breyers of any sort again? I doubt it. Enjoy if you can.